Now this guy is the type of inspiration I use each year for Moustache March. 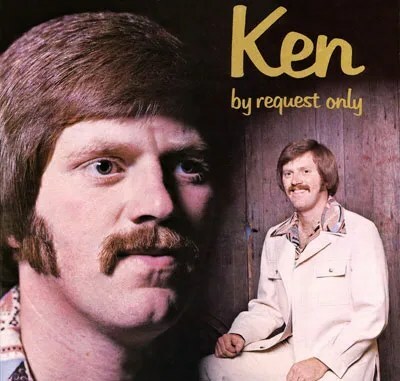 Ken’s By Request Only album, released in 1976, has been recently been listed on the worst album covers of all time via several sites and email Fwds (I received a variation of this today, with the subject “I thought you would like this”). Now the great thing about this is the fact that in 1976 this album made perfect sense. My parents have several variations of the “cross fade” picture and that suit was hot stuff. More importantly his hair, sideburns and moustache were hot. Now I wish I had a head of hair like Ken’s because I would shoot for his exact look. Needless to say I am stuck with a much thinner head of hair, but the moustache, that is why I grow one every March, so that I can honor a better time, when an album cover like this one makes sense.